Margaret received the tiara as a wedding present from her parents, the Duke and Duchess of Connaught and Strathearn. (Margaret’s father was a son of Queen Victoria and Prince Albert; her uncle was King Edward VII of the UK.) The Connaughts bought the tiara in 1904 from E. Wolff and Co. In the portrait above, painted by Axel Jungstedt around five years after her marriage, Margaret is depicted wearing two tiaras: the Connaught tiara on her head, and another wedding gift, the Khedive tiara, as an ornament on the bodice of her dress. 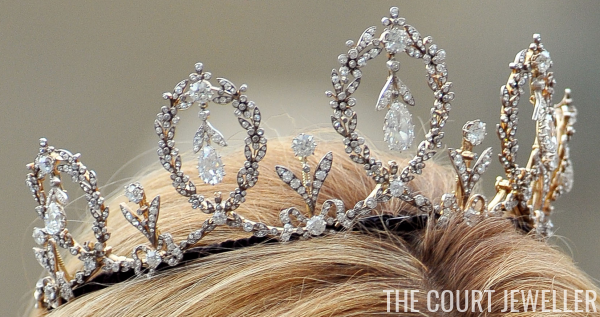 Princess Margaret didn’t wear a tiara at her wedding, but the Connaught tiara has adorned the heads of other Bernadotte brides and princesses. Princess Christina wore the tiara in 1974 when she married Tord Magnuson. Although many Bernadotte brides wear the family's Cameo Tiara, Princess Christina almost certainly wore the Connaught as a tribute to her mother, Princess Sibylla, who had died a year and a half earlier. 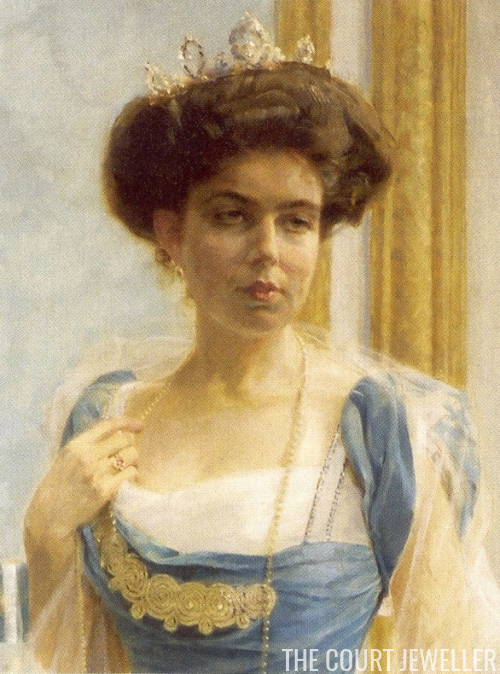 Within the family, the tiara is most frequently linked to Princess Sibylla. The tiara became so associated with her that it is sometimes simply called “Sibylla’s tiara.” She regularly wore the Connaught tiara at events like the annual Nobel ceremony and the opening of the Riksdag, Sweden's parliament. 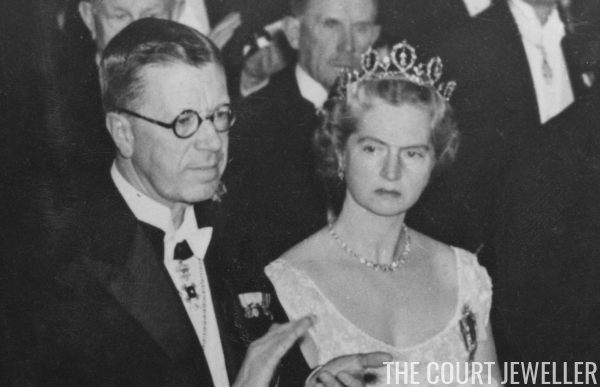 Above, she wears the tiara during the Nobel ceremony in 1948. Today, the tiara is owned by King Carl XVI Gustaf, who inherited it from Princess Sibylla. It is apparently a personally owned piece, not a part of the family’s jewel foundation. Shortly after he inherited the throne, the tiara became a touching link between Carl Gustaf's late mother and his new wife. Then still Silvia Sommerlath, she donned the late Princess Sibylla's tiara for the performance at the Royal Opera House on the night before her wedding in 1976. 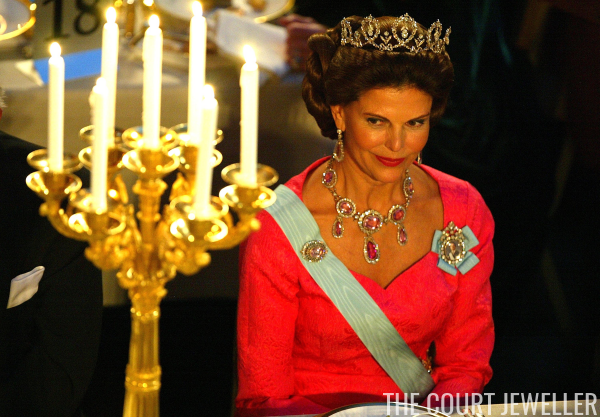 Silvia has continued to wear the tiara regularly throughout her husband's 40-year reign. Madeleine also famously wore the tiara at Crown Princess Victoria’s wedding in 2010, pairing it with the family's gorgeous Processional Necklace. The tiara choice was a last minute switcharoo, apparently — the press releases from the day had Madeleine’s tiara wrong, and as you can see in the photo above, the base of the tiara was still wrapped in dark material to match her mother’s hair. Some thought Madeleine might choose this one for her own wedding, but she ended up wearing her mother's modern fringe tiara instead. 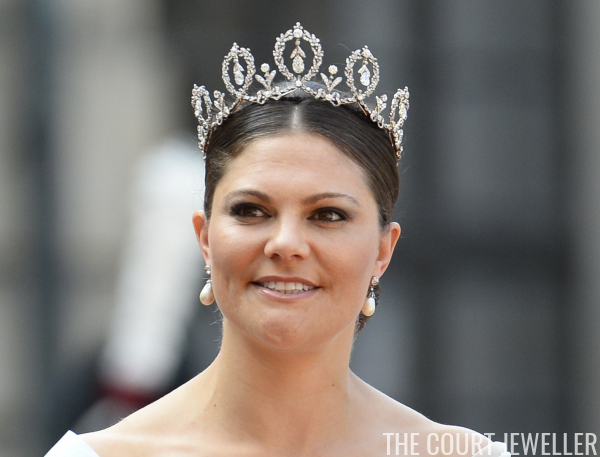 In 2015, Crown Princess Victoria also began wearing the tiara. She wore it in public for the first time at the wedding of Prince Carl Philip and Princess Sofia in June. 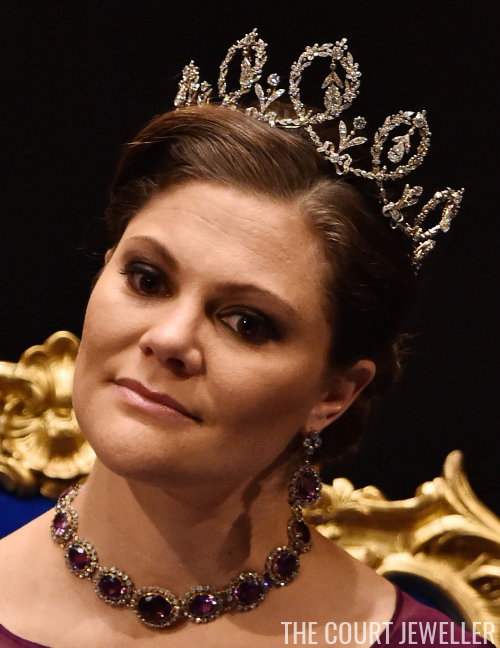 Victoria also paired the tiara with pieces from the family's amethyst parure at last December's Nobel ceremony. In the photo above, you get a good sense of the way the tiara's drops move as the wearer moves. 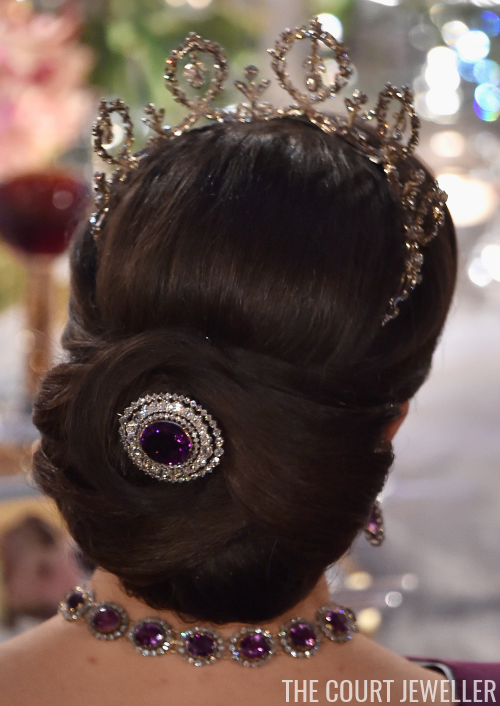 The Nobel banquet often gives us the rare chance to see unique perspectives of the Bernadotte tiaras; above, you can see the tiara from the back (as well as the gorgeous diamond and amethyst brooch in Victoria's hair).